John Cena is selling it like he was really powerbombed onto the floor except he wasn’t. 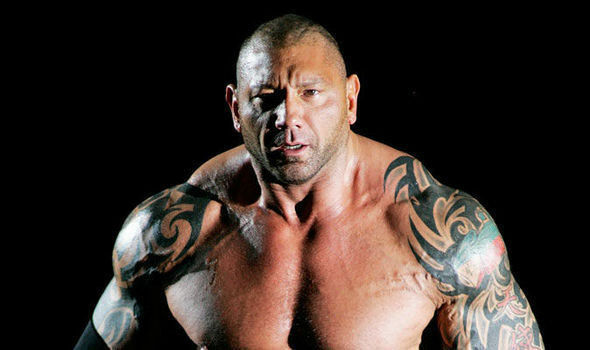 Batista is practicing for his future role as Drax by remaining incredibly still and hoping no one sees him on the floor. You can hear one referee ask, “Who landed first? Who landed first? He landed first? Oh, he landed first.” On camera you think that these are just the dumbest referees in-character, but in reality they were asking the people in the back to check the video to see if John Cena had in fact landed first. He didn’t. One referee holds up Batista’s arm as the winner for about 10 seconds while all the other referees are looking around the arena; presumably scouting for new jobs. You hear someone off camera yelling, “Raise his hand, raise his hand!” The referees struggle to pick John Cena up as they attempt to let him know to get in the ring, but he’s still selling the powerbomb that never happened. It finally clicks what they are trying to tell him, because he suddenly stops selling and rolls into the ring as if nothing had just happened. That’s the kind of no-selling we’d expect from 2016 John Cena, but in 2005? The referee raises John Cena’s hand as he visibly rolls his eyes at what’s going on, and Batista looks like someone just asked him the world’s hardest elementary level math question. To recap, Batista powerbombs himself over the top rope, the referees have no idea what is going on, the brand’s respective general managers are nowhere to be seen, and Vince McMahon is now sitting in timeout in the middle of the ring. As a fan it looks like everything is planned other than Vince appearing to have worn himself out between the entrance and tossing his jacket on the ground. In case you need a good laugh, watch as both John Cena and Batista lean over Vince who’s still sitting down as they yell in his face about how they’re the winner in the same way parents might scream at their kid about who loves him more while he plays with Legos. Let’s take it from the Powerbomb. And, ACTION! Mr. McMahon demands that they restart the match, so all 30 men sprint back into the ring. Okay, actually, they only restart the John Cena and Batista part which seems a bit unfair to literally everyone else. I wish I were kidding with this last part, however, but Batista goes for the powerbomb right at the very beginning of the rematch. John Cena visibly signals to him that he’s going to reverse it, most likely because yelling, “THEY SAW US DO THIS ENDING ALREADY MORON,” would have been too subtle. They do three more moves, one of which really was the powerbomb, and Batista easily tosses John Cena over the top rope for the win. Luckily, Batista went on to main event WrestleMania, because if he hadn’t we wouldn’t have gotten the joy of Bluetista.